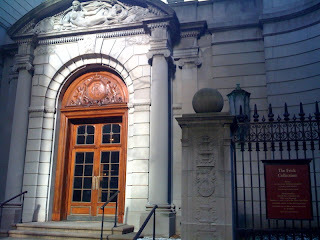 The Frick Collection, located on East 70th Street, is housed in the former residence of Henry Clack Frick. It's the artwork Frick hoarded during his years as one of the most ruthless of New York's coal barons. He spent millions on the best of the European treasures, including paintings by Rembrandt, Vermeer, Fragonard and Whistler, as well as decadent 18th century French Furniture. The entrance to the mansion. 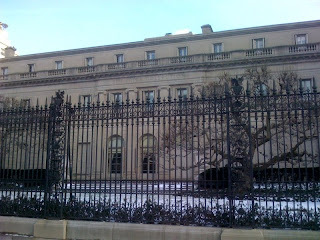 Opened in the 1930s, the museum has been kept almost just like the way it looked when Frick lived in the mansion, including large marble fireplaces in almost all the rooms and painted Renaissance-like walls, so it gives an interesting glimpse into how "large" the elite in New York once lived. Considering this mansion is located directly across from Central Park and is surrounded by luxury high-rise buildings, we wonder what this mansion would be worth in today's real estate market. We weren't allowed to take photos inside the mansion areas but this courtyard in the middle of the mansion should give you an idea of how impressive it is. 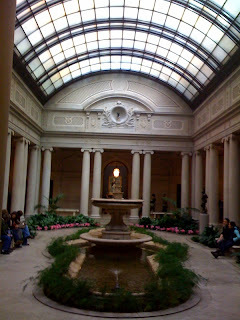 This courtyard was also a nice place for people to relax between art viewings. The art collection was impressive (sorry, no photos allowed inside), as well as their current exhibition - the bronze collection by renaissance sculptor Andrea Riccio. We were so curious to see the roped off second level, especially upon seeing the large organ pipes leading to the upper level. There was no line on a Saturday to buy admission tickets, it was uncrowded, and the relatively small spaces allowed us to see everything in the museum in about two hours at a nice pace, although some of the paintings in rooms with skylights were hard to view because of the natural lighting. There were also ample furniture to sit on (so nice that you think they're part of the exhibit) and the bathroom here was by far the cleanest, nicest museum restroom (Guggenheim, please take note). After you're done at the Frick, head across the street to Central Park (in short walking distance to the Boathouse mentioned below).